In a year in which Sri Lanka have continued to sink further into the depths of ODI ineptitude, they surely hit rock bottom today. In a performance that put an exclamation mark on their run of 12 straight ODI losses, they illustrated why they have struggled so badly in the format. They couldn’t bat, dismissed for 103 in 26 overs. They couldn’t bowl all that well, taking only one wicket as Pakistan cruised home with over 30 overs to spare. It is another whitewash for Sri Lanka, the third they have suffered this year alone. South Africa and India were the other tormentors. 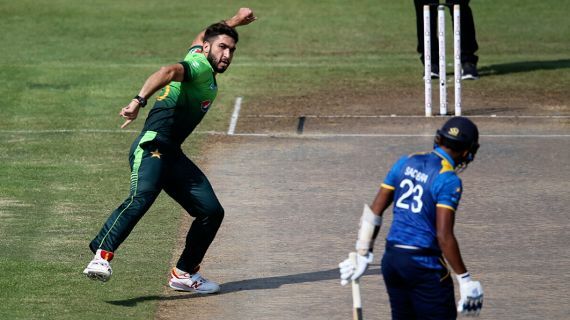 The prospect of a damning defeat was writ large over the contest after the very first over, in which Usman Khan took the first two wickets of a staggering opening spell. He had come to prominence with a scintillating performance in a domestic T20 final in 2013, but after today, that domestic admiration can turn to international acclaim. It tends to happen once you complete a five-for in 3.3 overs. Maybe there’s a peculiar curse Sharjah has cast on Sri Lanka – they’ve been bowled out below 100 four times at this ground. It could have been five; they were 85 for 9 at one point, before Dushmantha Chameera and Vishwa Fernando put together an 18-run partnership and rescued their side from that ignominy. For the third straight game, Upul Tharanga won the toss and chose to bat. But Sri Lanka’s luck has remained confined to the toss this tour. One over into the innings, it was clear that wasn’t going to change today. The dismissals themselves were something to behold; it was Pakistani fast bowling at its most exhilarating. Sadeera Samarawickmara failed to adjust to the moving ball and inside-edged onto his middle stump. Dinesh Chandimal was utterly helpless against one that swung away, edging to Sarfraz Ahmed. In Usman’s second over, Tharanga – just like the previous game – was unable to prevent one from sneaking in between his bat and pad. Niroshan Dickwella fell lbw to another prodigious inswinger. Siriwardana tamely scooped to cover point, and in under 7 overs Sri Lanka were 20 for 5. Thoroughly dispirited and broken all series, Sri Lanka had dug themselves into a hole in the first half hour of the game, and were already reduced to respectability restoration. Then Thirimanne edged Hasan Ali to the wicketkeeper and Seekkuge Prasanna ran himself out in a horribly amateur way, failing to ground his bat in a bid to avoid a throw in his direction. Pakistan didn’t need that sort of charity, but it was welcome. Thisara Perera struck a few boundaries en route to 25, the top score for his side. But in an innings where wickets were the currency of choice, that sort of resistance was merely pennies on the dollar. Hasan and Shadab Khan cleaned up the tail, and Pakistan were left with 104 to get to sweep the series. There was no drama to be had, with Sri Lanka coming out looking like a boxer for whom the knockout punch would be a blissful release. The second innings was a case of two teams going through the motions. But while Fakhar Zaman fell short of a half-century, reasons for joy were in short supply for the visitors. Pakistan looked almost embarrassed to complete the whitewash, so wide was the chasm between the two sides. However, the major discomfort all belongs to the visitors, who will be left pondering how on earth to salvage some pride in the upcoming T20 series.